My art teacher at high school, the amazing Mr Carberry, used to assign his first year pupils the task of drawing a bike from memory. He'd give everyone a piece of paper and a pen and tell them they had 15 minutes to draw a bike. Go! When the time was up, Mr Carberry would gather the class around his desk and flick through all the work. The drawings were, as you'd expect from a class of uninterested 13 year olds, all over the shop. Everyone would laugh as he pointed at the twisted frames, the mismatched wheels and the precarious saddles. He'd then give us a brilliant wee demonstration on how, with a little thought, a bike will almost draw itself. "Well, you need two wheels, don't you?" he'd say, "and you'll need to be able to steer, so that must mean the handlebars are attached to the front wheel." With a quick few strokes, he'd explain that the pedals must be where your feet go, the seat must be where your bum goes, join them up and, bang, there's your bike. It was a great little lesson that has stuck with me for well over 10 years now. It was interesting, funny and inspiring. It helped that Mr Carberry was a proper beret wearing, baldy headed, moustachioed, mad-as-hell art teacher too. There are a thousand more of his lessons that are worth mentioning, but this one just came to mind. 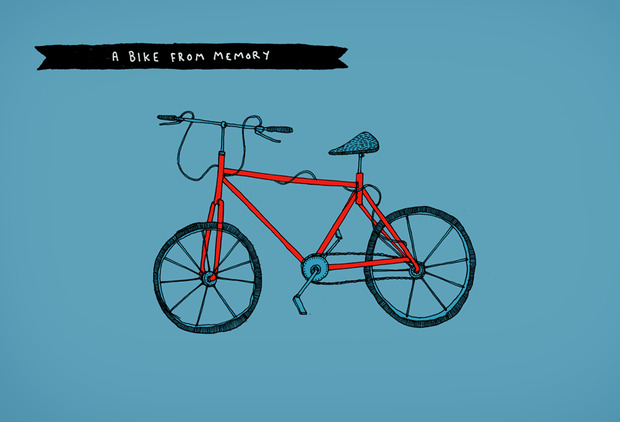 Today I drew a bike that came out wonky and it took me right back to high school. A quick wee drawing for Illustration Friday. This week the topic is impatience. This month sees artwork by Gary Bolam, Cheryl Field, David Galletly and Lewis Holleran. Come join us on the 1st of August 7-9pm for the launch of both the jewellery and sculpture exhibitions. A glittered deer skull, mechanical creations, stone cornflakes, video works and narrative jewellery all await you. Our new artist books section will be making it’s first appearance in the showroom also. The exhibition will run until the end of the month. Stop by for the opening if you can. I think there will be all the usual music, drink and chitter chat. On a related note, there should be a little more Che Camille news from me in a few days. A while ago I was asked to draw the Paper City page in Blueprint magazine. The idea being that, in each issue, a different artist, designer, architect or illustrator showcases their personal vision of a utopia. This week, Blueprint are putting together an exhibition of their Paper City archive at the Royal Academy of Arts in London, my little drawing included. I won't make it down to see the show personally, but if you find yourself nearby I'd recommend you take a look. I'll post some images if I come across them. 12 months: 12 photos for each. Well, that's the idea anyway. In reality I extended and shortened a few to include certain pictures. It's chronological though - New Year to New Year. With a little more deliberation I could have built the image out of funnier/more interesting photos or stuck to a '1 photo per event' kind of deal. I think I'd have driven myself crazy doing that though. I kinda just dragged and dropped things that caught my eye. I guess there's also little in the way of art related stuff in there, but hey-ho. No doubt there will be a few more posts looking forwards and backwards this week. I'm not quite up to churning out full lists of my albums/shows/films of the year, but I'm sure I'll find something to talk about. It is January after all, the month of bullet-point lists.